Home » Uncategorized » Stubborn Acne That Won’t go Away? 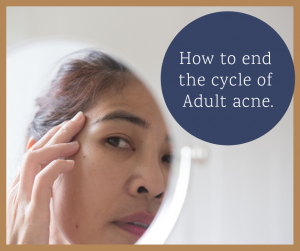 Treating adult acne at the root cause can help you deal with this often-frustrating issue in a more permanent way, and often the more stubborn cases come down to a hormonal imbalance. Whether you’re in your 20’s or firmly in perimenopause, working with an naturopathic doctor can help you look at your full hormonal picture, and find the right plan to bring your hormones, and your skin, back in balance. If you have done what you can and are ready for professional analysis and guidance on skin-friendly treatments, come into the office! Together we can look at your diet, coping mechanisms, and other possible contributors. Adult acne doesn’t have to be frustrating.